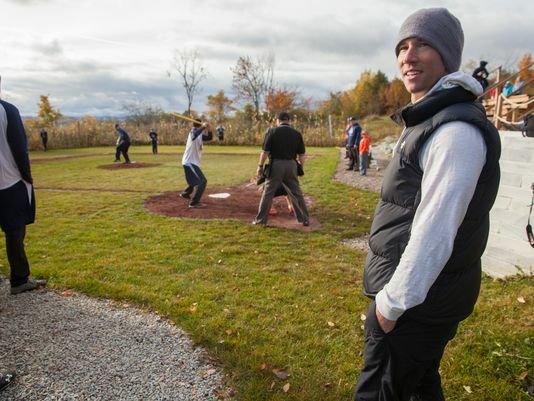 Former Red Sox pitcher Craig Breslow was back at Little Fenway Saturday to host a second annual wiffle ball tournament to benefit his Strike 3 Foundation that focuses on childhood cancer research. Fourteen teams were on hand, playing games at Little Fenway, Little Wrigley and the Little Field of Dreams. Last year, Breslow was joined by Sox teammates, Rick Porcello and Rich Hill. They are both busy this year, with Porcello pitching for Boston in the American League Division Series and Hill with the L.A. Dodgers. However, major league infielder and former UVM baseball standout, Matt Duffy, was able to make the trip. Duffy spent parts of the last two years with Houston before being released in July. He was then claimed by Texas, but is not on the Rangers postseason roster, allowing him to make the trip. The tournament is free and open to the public.